and special guests John Densmore and Robby Krieger. 1. What is All Wood and Doors? 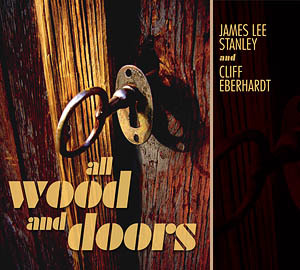 All Wood and Doors is a recording project created by James Lee Stanley and Cliff Eberhardt, who picked 12 of their favorite classic Doors songs and re-arranged them for acoustic guitars and voices. Cliff and James sat in the studio facing each other and played the songs until they evolved into the songs you hear on the CD today, and then worked out wonderful vocal harmonies and background vocal parts. 2. What kind of instrumentation is used on the CD? The complete list is in the Instruments page. Both Cliff and James Lee use Elixir® Strings exclusively. 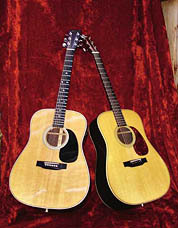 Their guitars include a Martin JCD16RGTE, Granata Dobro / Collings D2H, Martin D-28H, and Taylor 810 CE. No synths, just live musicians making live music. 3. Who did the vocals? James Lee and Cliff shared the lead vocal and lead guitar chores and they did the backgrounds themselves. Timothy B Schmit of the Eagles added his wonderful high tenor to the backing vocals on several tracks. 4. Who are these guys? James Lee Stanley has quite a bio, which can be accessed on his site www.jamesleestanley.com. The same is true of Cliff Eberhardt at www.cliffeberhardt.net. Between them they have recorded over 30 albums from 1972 til now, a body of work supported by critical acclaim and a broad base of patrons who love what they do. 5. Why should I buy your CD? You should buy this cd if you love acoustic guitars; if you love tight harmonies, great lead vocals and fantastic vocal harmonies à la The Beatles, the Beach Boys or Crosby Stills & Nash; if you love the classic Doors songs; and if you love clean recording and brilliant production. 6. How am I going to buy it? 7. When did this band start playing together? James Lee Stanley recorded three albums for Wooden Nickel/RCA Records in 1973-74 and has recorded ever since. He now has 25 albums to his credit. In 1990 Cliff Eberhardt's song "My Father's Shoes," appeared on Windham Hill's Legacy collection, leading to a deal with the label. They released Cliff's first album, The Long Road (1990), a work featuring a duet with Richie Havens. He now has 9 albums to his cradit. This is the very first time that Cliff and James Lee have recorded together. 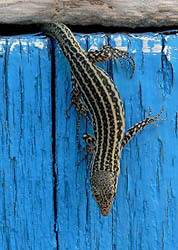 Most of their recording for the All Wood and Doors CD was done in May and July 2010. 8. Where is this band from? James Lee Stanley is from Virginia by way of Pennsylvania and currently lives in southern California. Cliff Eberhardt grew up in Berwyn, Pennsylvania and has lived in Illinois and Colorado before moving to New York in 1978. 9. Who produced the CD? 10. Does this band have any other CDs on the market? Yes, James Lee Stanley has 18 solo recordings, as well as three duet CD's with Peter Tork, one duet CD with Michael Smith, and the All Wood and Stones CD with John Batdorf. His latest solo CD is Backstage At The Resurrection (2010, Beachwood Records). Cliff Eberhardt has 8 solo albums including three on the Windham Hill label, and five on Red House Records. His latest solo album is 500 Miles: The Blue Rock Sessions (2009, Red House). Check their respective websites for details. 11. How did they come up with the title of the CD? This CD is in a sense a follow-up to the All Wood and Stones cd released by James Lee Stanley and John Batdorf on Beachwood Records in 2004. Because that recording was acoustic guitar-based and the songs are all classic Rolling Stones songs, the title All Wood and Stones just seemed like exactly the right thing to say. Since this collection is all classic Doors songs, the title All Wood and Doors simply folllowed form. 12. What is the message of the band? That we believe in great songs, great vocals and vocal harmonies and great sounding acoustic guitars played well. That is what we aspire to do whenever we go into the studio. We wanted to hear these classic Doors songs done in this kind of atmosphere. And we wanted to have grand fun doing it. 13. Where and when is the band playing live? Right now, we are focusing on getting the world to know about the CD. Then we expect to go on the road and do concerts, at intimate theaters and perhaps concerts under the stars at various wineries in California. Check the "Appearances" page of this website for upcoming concert dates. 14. What is the press saying about the CD? We have had nothing but rave reviews from every single person who's heard this CD. We back it up. We guarantee it. If you don't like it, you have 60 days to send it back, no questions asked, and get a full refund on the price of the CD. See the "Review" page of this website for more reviews and press to be posted as they come in. 15. You've done Stones and Doors... What's next? There are currently no plans for another CD in the "All Wood And..." series. However, that could change. Please feel free to pass on your suggestions to James Lee Stanley at the email address on the "Contact Info" page of this website.